back for the deposit refund. 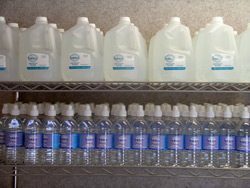 Of the ten states that have bottle deposit laws, some are adding the deposit requirement to new beverages such as bottled water. Forty other states have no deposit law at all. are so many waters out there, so many juices, so many other brands. law. Distributors don’t want to hassle with picking up the empties. volume of empties being returned. And Georges isn’t the only one who thinks it would be good for the environment. Polls show a large majority of people support the idea. Council. He says it’s time to expand the law to other containers. and bottles were the biggest concerns. “It’s hectic, yes, it really is, you know, to deal with these empties. bottles headed for the landfill. Coca-Cola’s position on bottle deposit laws. bouncing along on a conveyer to be washed and then filled with water. distribute water far outside the basin. Detroit River, which connects the upper Great Lakes to the lower lakes. from water, it’s just water. Bill Lobenherz is a lobbyist for the Michigan Soft Drink Association. He says bottled water is a value-added product, just like the many others. Dave Dempsey is the Great Lakes advisor for the environmental group Clean Water Action. water plant trucks away even more than that. But that’s still not that much water compared to other uses. profit from it will begin to horde it, and control it. gallon barrels? And then, tankers. decades ago and reduce sewer overflows into rivers and lakes. So Kirk’s group will meet with industry lobbyists in Washington D.C.
baby formula and health drinks. Kirk says polling shows people support having a dedicated source of funding for clean water. But a major brewer plans to fight the proposal. Miller Brewing says forty-four percent of the price of its beer already goes to taxes. don’t want the bottles at recycling centers. separated from the waste stream. come from states with bottle deposit laws. Radio Consortium, this is Chuck Quirmbach.